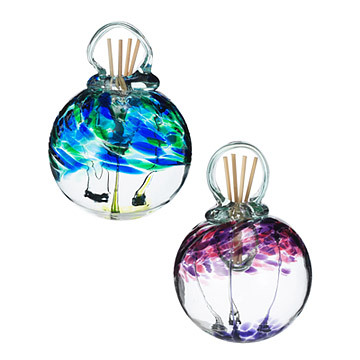 Energize rooms with swirls of color and scent with Stephen Kitras' hand-blown glass diffusers. Unwind: Mellow, purple streams compliment a soothing lavender fragrance. Balanced: Centering blues and greens calm the room with a cucumber melon blend. Handmade in Canada. Includes 1 oz. oil, 4 reeds. Iron stand sold separately. 4 oz. refills available, 10 reeds. Clean with a dry cloth. Intended for indoor use only. For stand, paint is rust-resistant; clean with dry cloth. Please use maximum 1/2 ounce oil to avoid spillage. WARNING - USE WITH CARE. SCENTED OIL CAN STAIN AND/OR DAMAGE FURNITURE AND CLOTHING IF SPILLED. I know this will look perfect in my mom's house. I wish they offered more choices for the oil like a vanilla or a clean linen scent. Extremely pleased with this item. It's a beautiful piece of art. This is my second time in buying this product. I love this product because of the essential oil smell that makes you relax. The globe is beautiful when sunlight shines on the globe. What beautiful products, better than how the looked on line. It is a gift and has not been given yet. The glass ball is beautifully crafted and the stand is a great way to display it. The lavender oil is not very strong smelling though. Gorgeous diffuser! Love this glass artist! His pieces are beautiful and unusual! So gorgeous and not the usual diffuser. Since this is a gift, I have not used the product personally. It is a beautiful scent diffuser with a pleasant scent. I felt confident my difficult-to-buy-for friend would like this and it seems I was right. She said it's a beautiful piece.